« The 12 Days of Kurisumasu are back for 2013! The Reverse Thieves announce the 2013 Anime Secret Santa project! One of the many things I find annoying about the holidays is that the Gods of Retail, for whatever reason, seem to want to move Christmas earlier and earlier every year. I mean, c’mon, it isn’t even Halloween yet, it’s still beastly hot in many parts of the country, and the kiddies have only just returned to school, and yet we’re already starting to see holiday promotions from businesses large and small. The latest entity to join this ungodly trend are none other than our anime blogging compatriots, the Reverse Thieves. But I’m willing to give them a pass on this, because it’s for a good cause. Yes, ladies and gentlemen, it’s Anime Secret Santa time once again! I can hear it now, some of you are probably staring at your screens yelling “WHAT YOU SAY !!“. Well obviously you must be new around here, because if you’ve been hanging around this blog and podcast for any appreciable length of time, you would know about Anime Secret Santa. After all, I’ve written about it several times before, and we’ve even participated in it for the past few years as well. Basically the Anime Secret Santa project involves a bunch of bloggers (and perhaps podcasters too) who get together and put their names into a virtual hat, which the Reverse Thieves then proceed to mix up. They then pair off bloggers, and ask each of them to recommend an anime for the other to watch. The trick is that they don’t tell them who the recommendation came from. Once you have your anonymous donors’ recommendations in hand, you then proceed to pick an anime off their list, watch it and review it. Yes, exactly like that whole Secret Santa thing, which you are undoubtedly familiar with. (After all it’s probably been used as a plot device in at least a few Christmas-themed anime episodes…) The idea is to get people to step outside their comfort zones if you will, and watch and review shows they may not have considered before. It’s a great way to find out about anime that, maybe you might not have considered before, but ended up liking a lot. (Or maybe you hated it, and then you can write a really scathing review. There have been some pretty hilariously epic ones.) Plus it’s a lot of fun. All entries are due by Sunday, October 6th, so you better hurry! Check out the Reverse Thieves blog post for full details and where to send in your entry. Naturally, if the fates allow it, Otaku no Podcast will be participating this year as well. And we hope that you will too! The Reverse Thieves announce the 2012 Secret Santa Project! 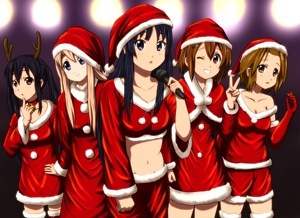 The Reverse Thieves announce the 2011 Anime Secret Santa project! 1 comment to The Reverse Thieves announce the 2013 Anime Secret Santa project!